Guide six brave heroes on their adventure as they navigate treacherous terrain swarming with bandits. Travel along the bustling and dangerous Silk Road - an ancient trade route stretching from China to the Mediterranean Sea, trading exotic goods and engaging in real-time battles. 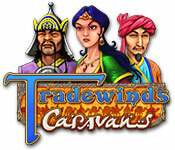 Hire fiercely loyal warriors for protection and explore a long-lost world in this Adventure game teeming with tantalizing secrets, hidden cities, and legends of mythical creatures in Tradewinds Caravans.